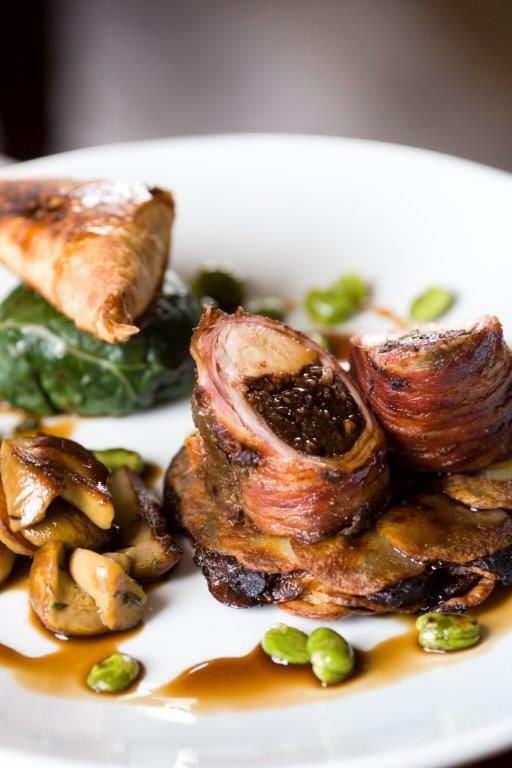 A great little recipe pairing rabbit with black pudding, delicious and moderately easy to make. 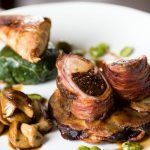 This recipe makes a change for the normal rabbit casseroles have a go. Mix black pudding and thyme leaves in a blender until smooth. Run a sausage of the mix along the rabbit loin. Roll up the joint, using the thin flap of rib meat and skin to seal. Lay a large sheet of cling film on a table and set out a row of bacon rashers, slightly overlapping, with the rabbit on top. Roll the bacon up round the rabbit. Wrap the joint tightly in the cling film and refrigerate for up to 24 hours to set. Before cooking, remove cling film and seal the rabbit all the way round in a medium hot pan with vegetable oil and a knob of butter. This takes about two minutes. Preheat oven to 200°C and roast for six to eight minutes until the meat is just opaque. Keep warm. Cabbage Blanch four outer leaves of cabbage (minus stalks) in boiling salted water for two minutes. Refresh in cold water. Shred remaining leaves and braise in a little butter with a pinch of thyme leaves for 15 minutes on a gentle heat. Allow to cool. Wrap an individual portion in each of the outer leaves and enclose in a tight parcel of knotted cling film. Poach in hot water for about 5 minutes. Pastry triangles Layer filo pastry sheets with butter in between each layer. Cut into four triangles and bake at 210°C for five minutes or more until golden brown. Sauce Reduce the red wine and chicken stock by half in a saucepan. Season with salt and pepper. Warm a few broad beans in the sauce to use as garnish. Finally, remove the cabbage portions from cling film, carve the rabbit and arrange dish as shown.